Ripon, California U.S.A. December 12, 2014 – Guntert & Zimmerman (G&Z) is proud to take part in World of Concrete 2015 (Central Hall, Booth #C6474) by unveiling its New MP550: Material Placer. The MP550 is designed for versatility, high production, ease of maintenance and has the lowest operating cost of any machine in its class. The MP550 is the most versatile material placer on the market. It is capable of handling a wide variety of concrete slumps as well as dry materials. The MP550 features four wheels with high flotation tires. It is four-wheel drive with acumen, dual axle steering with only a 12’ (3.66M) inside turning radius. This offers greater ease of movement in and around the jobsite. Its concrete hopper design has been carefully crafted to reduce dump box height. The MP550 hopper’s front lip is only 23” (584mm) off the ground allowing it to receive the widest range of trucks. The MP550’s 35’ (10.7M) long Swing Conveyor, which can pivot 170 degrees, is designed with a hinge point near the tail pulley for ease of clearing barrier walls and other jobsite obstructions while minimizing the material discharge height. The MP550 is capable of the highest concrete spreading production on the market. Its industry leading hopper size can hold approx. 5.5 cyd (4.2 m3). The hopper’s unique front “flop gate” is designed with a hydraulically adjustable rubber seal to virtually eliminate concrete losses while dumping. 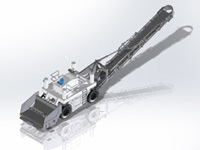 The hopper is also available with hydraulically adjustable front pusher rollers. 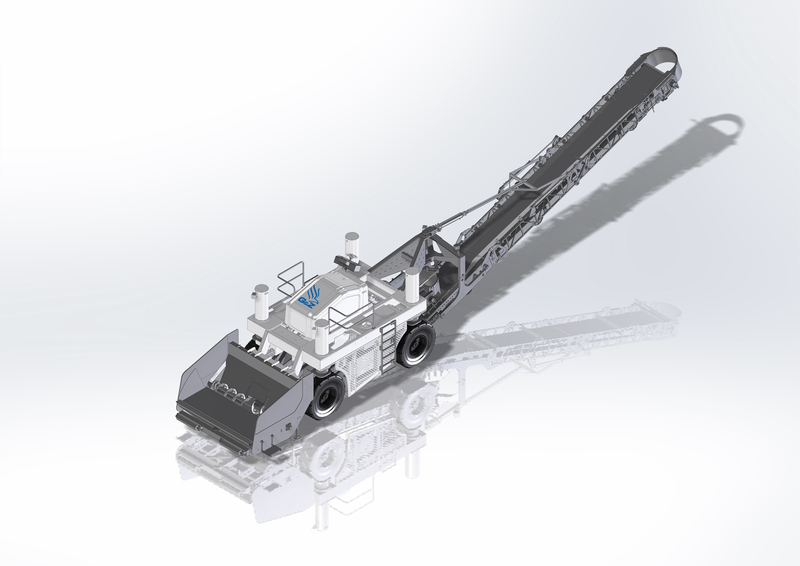 The high capacity Transfer and Swing Conveyors are capable of handling the largest loads without stall or slippage. The conveyors are equipped with rugged motors that offer ample torque for high production placing. The MP550 is designed to be the easiest placer on the market to clean and maintain. G&Z put heavy emphasis on making the conveyors and their components readily accessible and easy to clean and maintain. The hopper has been designed with a quick-release mechanism to allow the carrier to safely walk away for ease of access, cleaning or switching to other attachments. The carrier side panels safely guard the transfer conveyor during operation and provide access during daily cleaning. The tail end of the transfer conveyor can quickly be lowered (or even disconnected) for cleaning and maintenance. Each conveyor has also been meticulously designed for ease of continuous belt replacement in the event of a failure. The MP550 is outfitted with a Tier 4i engine with a simple design solution for upgrade to Tier 4 final. The Tier 4i engine features low fuel consumption and does not have a particulate trap like other Tier 4 engines. It also features extended service intervals. Our “Eco-Mode” feature on the MP550 reduces fuel consumption by up to 35%. The tire over track design choice dramatically reduces maintenance and up keep costs. Because the conveyors are accessible and easy to clean high, the operating costs associated with concrete belts is dramatically reduced. The MP550 is also designed to be quick and easy to transport saving contractors transportation cost.